XLM/USD is the best-performing coin out of Top-10. The community celebrates the new milestone in the project's development. Stellar (XLM) is one of the best-performing digital coins of Top-10 with 3.3% gains on a daily basis. It is changing hands at $0.23 at the time of writing, off Tuesday's high reached $0.2360. Stellar is the coin behind the open source cross-asset payment framework forked from Ripple in 2014. It takes the 6th place in the rating of the top largest digital coins by market value. Its capitalization reached $4.29B, while the average daily trading volume settled at $58M. According to the information revealed by Twitter user OrbitLens, the network surpassed the threshold of 1,000,000 accounts, which is considered to n=be a significant achievement and the evidence of Stellar's growing success. "New #Stellar milestone passed: 1,000,000 accounts on the ledger. Congratulations to @StellarOrg and awesome Stellar Community!" Stellar features extremely low transaction fees and high speed, which makes it both a cryptocurrency payment system and a cross-asset transfer network. Apart from that, it is completely decentralized and open source. Apparently, these benefits appeal to users, promoting Stellar's success. 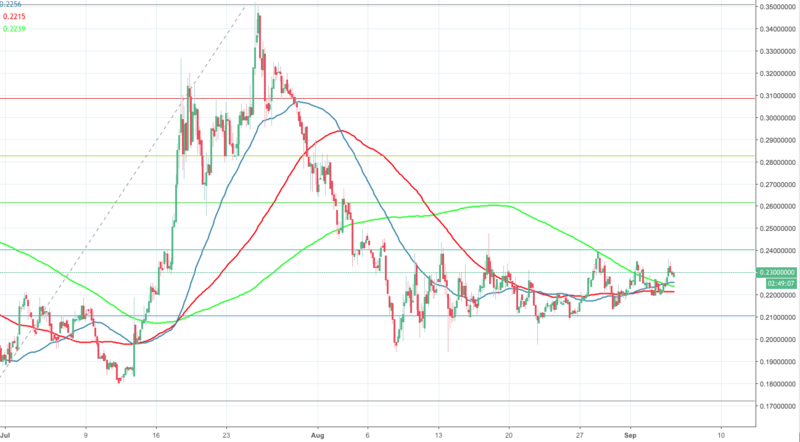 On the intraday basis, XLM/USD is supported by a combination of SMAs (4-hour charts) on approach to critical $0.22 level. If it is cleared, the sell-off may be extended towards $0.2104 (78.6% Fibo retracement). On the upside, the resistance is created by $0.24 (61.8% Fibo retracement). This level has been limiting the recovery since the beginning of August.